There’s a New Wizard in Town! “Who would you like to be when you grow up?” Janusz Korczak asked a class of boys. “A wizard,” one of them replied. The others started laughing, and the boy felt embarrassed, so he added: “I’m sure I’ll be a judge like my father, but you asked who we’d like to be.” That was in 1929, and four years later Kaytek the Wizard, the story of a wayward boy who develops extraordinary magical powers, was first published in Polish. When Kaytek the Wizard was released in 1933, itoffered a new perspective on children, their dreams, complexities, and abilities. Korczak, a renowned pioneer of children’s rights, was one of the first modern writers to imagine a child as a full and complex wizard figure. 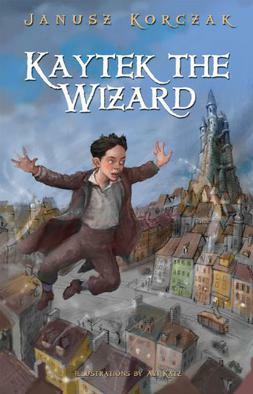 As such, Kaytek the Wizard was a precursor to Harry Potter, and Korczak’s fiction has been described as having been as well-known as Peter Pan in his day. Janusz Korczak (1879–1942) was the pen name of Dr. Henryk Goldszmit, a pediatrician and child psychologist who famously ran a central Warsaw orphanage on innovative educational principles. Korczak left behind a large written legacy, including books on education, plays, essays, letters, and of course, novels and stories for children, including King Matt the First. Kaytek has previously been published in German, Spanish, Hebrew, and most recently French. This first English translation of Kaytek the Wizard coincides with the Polish Parliament’s declaration of 2012 as “The Year of Janusz Korczak.” This year contains two important anniversaries connected with Korczak: the 70th anniversary of his death – heroically accompanying the children of his orphanage – in the Treblinka concentration camp, and the 100th anniversary of the founding of his orphanage on Krochmalna Street in Warsaw. Throughout the ages, what happens after we die has been a source of discussion, debate and dissertation by persons of all religions and backgrounds throughout the world. Despite the thousands of texts written on the subject, there is no official Jewish position on life after death, although most scholars agree the soul lives on in some form after the physical body dies. Most Jewish spiritual leaders believe the focus should be on living righteously on Earth rather than putting emphasis on the afterlife. The idea of life after death, including reincarnation, is supported by many of today’s scholars as well as centuries-old Jewish texts. In her book Journey to Heaven: Exploring Jewish Views of the Afterlife (Urim Publications; 2011), author and biblical scholar Leila Leah Bronner of Los Angeles writes that the Hebrew word gilgul, which means circularity and refers to the actual transmigration of souls, first appears in the Zohar, the 13th-century foundational literary work on Jewish mysticism. Several passages in the Zohar allude to the idea that one’s conduct on Earth determines his or her fate after death, says Bronner, an early member of the Jewish Orthodox Feminist Alliance. The text includes vivid descriptions of a place called Gehinnom (Hell), where all but the most righteous souls go for purification before they can ascend to higher levels. The review above is excerpted from an article in the Detroit Jewish News. The full article can be read here. New Edition of the Encyclopedia Judaica for Only $995! Since 1972, the Encyclopaedia Judaica has been the leading source for information on the Jewish people, the Jewish faith, and the state of Israel – how they have shaped and been influenced by our world. The second edition of this important reference is now available for a new generation, as a result of a US-Israeli publishing partnership under license of Keter Publishing House, the publishers of the original 1972 edition. * This special sale is only for orders in the Continental US and Canada. ** Special reduced mailing costs to the Continental US and Canada: $7.00 for a full set of 22 volumes. There is probably no game as difficult and captivating as chess. Millions of people break their heads over chess strategies and spend years learning its ins and outs. It holds them captive as nothing else does. They dream about it and discuss the move of a single pawn as if their lives depended on it. They will follow the most famous chess tournaments and discuss every move of a world champion, for days and even years. They replay famous, mind-boggling games of the past, even those that took place as long ago as 70 years. These chess aficionados try to improve on those games of the distant past, often getting into heated arguments about a brilliant or foolish move that took place 50 years earlier. Thousands of books, tens of thousands of essays have been published on how to get better at the game. The rules are set up in the World Chess Federation’s FIDE Handbook. Strategies are developed and tactics suggested; countless combinations have been tried, to the point that some typical patterns have their own names, such as the Boden’s Mate and the Lasker-Bauer combination. Mikhail Botvinnik revolutionized the opening theory, which was considered nothing less than a Copernican breakthrough. Famous chess studies such as the one published by Richard Reti (1921) are revelations of tremendous depth. (He depicted a situation in which it seems impossible for the white king to catch the advanced black pawn while the white pawn can be easily stopped by the black king). THE RULES are ruthless. There are no compromises, no flexibility. Kaytek is a precocious Polish boy. He taught himself to read and loves books but he’s a little odd and doesn’t fit in at school. Kaytek decides he wants to be a wizard and practices making things happen by saying, “I want, I demand . . . [whatever he wants].” He’s a bit of a brat so he plays a lot of pranks and causes trouble. When he tries to do good, he finds that he’s misunderstood (often blamed for trouble caused by others). Eventually, he is driven from his home in Warsaw. He cares deeply for his family so when he travels the world, he leaves behind a duplicate of himself so his parents won’t be worried. As he travels the world, Kaytek’s ego is fed but his soul is not. He finds that what he loves more than anything is his home and family. He desires to do good but plans and follow-through have a rough time getting together. Will Kaytek ever learn how to control his impulses and restrain his powers? We’ve all been told not to judge a book by its cover, but as it happens, the cover of Nehama Leibowitz: Teacher and Bible Scholar is actually quite instructive, especially when compared with another recent book on the same subject. On the front of Yael Unterman’s English-language book is a fuzzy photograph of an elderly Leibowitz standing in front of a blackboard, her face dominated by the thick black rim of her glasses and her hair modestly concealed beneath her signature beret. By contrast, the cover of a recently published Hebrew-language biography features a crisp image of Leibowitz as a young, smiling woman, her heavenward gaze unmediated by spectacles as a breeze ruffles her unrestrained hair. And indeed, Hayuta Deutsch’s Nehama: The Life of Nehama Leibowitz (Yedioth Ahronoth Books and Chemed Books, 2008) allows the reader to see just how the old woman the one remembered, respected and loved by the many former students quoted in Unterman’s book – went from being the young Nehama facing the wind to the venerated, yet eminently accessible, Torah scholar and role model she became. Though Deutsch’s book does more or less gloss over Leibowitz’s role in Diaspora Judaism, it is much more of a classical biography than Unterman’s; it progresses in chronological order, and puts Leibowitz’s accomplishments squarely in the context of her family (including her outspoken and controversial philosopher-scientist brother, Yeshayahu Leibowitz) and of the events and prevailing trends in her native Europe and adopted homeland of Israel, lending an added depth to the reader’s understanding of where Leibowitz was coming from. When you picture someone reading your work, how do you see them? What do they think about, wear, and do? Or, maybe a better way to say it: who do you write for? And how do you see your writing nourishing others? My readers include anyone who is genuinely interested in the spiritual and philosophical journey. Since much of my work focuses on Judaism and Jewish philosophy, many of my readers are Jewish. Some are very committed, Orthodox Jews, but others are less traditional. But I also have many Christian readers. Since the book is very philosophical, it is not light reading and therefore not everybody’s cup of tea. But, since my newest book, The Conversation, is a novel, it allows the reader to follow the main character through a spiritual and philosophical journey that is also intensely personal. Some of my readers will sympathize with the struggles and doubts, spiritual highs and lows that are common along this journey. How do you use fiction as a practice for spiritual exploration, discipline, or growth? Can you offer any practical advice or sure-fire practices for folks interested in allowing writing to inform their spiritual discipline? You are currently browsing the Jewish Book Review blog archives for July, 2012.